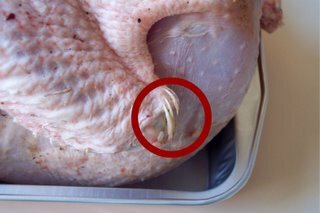 My turkey still has feathers in it. 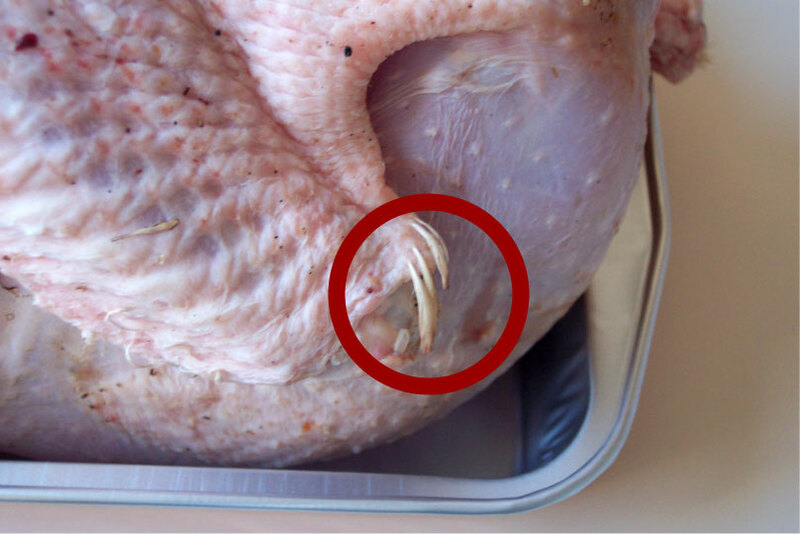 Here is a photo as evidence, with a red circle indicating a sample of the foul plumage. All right, so it's not quite Little House on the Prairie, but I still wasn't 100 percent thrilled to discover a new use for the pair of pliers I bought yesterday. By now, you're probably wondering whether or not I have ever cooked a real Thanksgiving dinner. Rest assured that I have -- twice, in fact. This is one of the reasons that Colin and I offered to host Thanksgiving at our apartment (i.e. I have experience that the other Michiganders probably don't have.) Of course, I'm used to the turkey coming frozen, pre-packaged with a pop-up timer and a rope truss. I'm also used to having my own roasting pan, a full-sized conventional oven, a big cutting board, and a good, sharp knive. 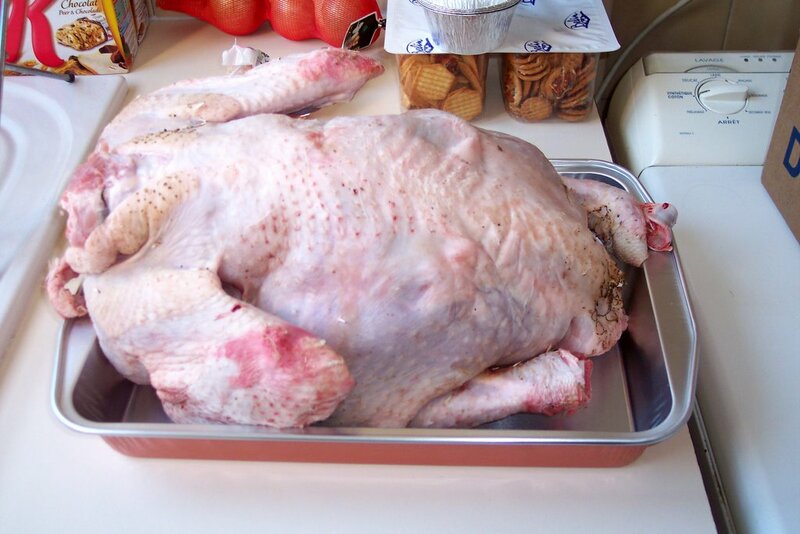 A 13-pound (6 kilo) raw turkey in a cardboard box. Faced with adversity, I did what any self- respecting adult would do. Dad answered the phone, at which point we began to realize that there was a 3- to 4-second delay in our connection. So, as you read the following recreated (and only slightly abbreviated) dialogue, you must insert an uncomfortable dramatic pause between each line. "Hello? Oh, OK, we were talking at the same time, I think." "Dad ... Dad, my turkey still has feathers in it." "I'm calling for moral support." "My turkey still has feathers in it." "BWA-HA HA HA HA HA HA HA HA HA!!!!!!!!!" Uh, not only did it have feathers, but it appears to have skinned elbows. Was this a purchased turkey, or perhaps a Parisienne version of road kill? It looks kinda scary. AND...where are the little metal things to hold his legs together? (The Hock Locks) You are certainly having an adventure my dear. BUT...was it tasty?